Kale that is considered closer to wild cabbage has magnificent health benefits with its various nutrition. In fact, ikale is also touted as "the new beef", "the queen of greens" and "a nutritional powerhouse." Kale that also called borecole, is a family of Brassica vegetables such as cabbage, broccoli and kailan. When consumed regularly, this vegetable is touted be able to shield the body from cancer and lowering cholesterol. Beside rich in minerals, kale is also full of antioxidant vitamins A, C and K. Carotenoids and flavonoids are antioxidants that have been proven to be effective in warding off cancer. That's why some people call kale as the healthiest vegetable on earth. In recent years, kale sales have increased quite sharply. As reported by the Daily Mail, the prestige of the vegetable soared thanks to celebrities and celebrity chef. Like the artist Gwyneth Paltrow for example, highlights the health benefits of kale through recipes posted on her website. The same thing was done by celebrity chef, as Fearnley-Whittingstall and Jamie Oliver. Both often use low-calorie vegetables in a variety of recipes. In a study published in the American Journal of Clinical Nutrition, stated that, consuming antioxidants vitamin K can reduce the risk of death from cancer. Vitamin K can also be found in spinach, kailan, and also cheese. Vitamin K is very good for maintaining body functions, ranging darh prevent blood clotting, antioxidant activity, to bone health. Although it's green, kale (Brassica oleracea Acephala Group) is a vegetables with higher vitamin C than oranges. One cup of sliced ​​thinly kale, already able to provide 134 percent of the recommended daily intake of vitamin C. While oranges only give 113 percent vitamin C intake. In addition to vitamin C, kale also provide 133 percent of the recommended daily intake of vitamin A. The amount is somewhat more than other types of green leafy vegetables. Kale is also a good source of omega-3 fatty acids. As already often mentioned, omega-3 fatty acids play an important role in maintaining brain health, reduce diabetes type 2, and support overall body health. The next nutrient contained in kale is calcium. Although not comparable as a whole, but kale also contains more calcium than milk. This will be good news for people who wants to meet daily needs of calcium but have milk allergy. Kale is a low calories vegetable, high in fiber and contain no fat. Calories in one cup of kale contains only 36 calories, 5 grams of fiber and 0 grams of fat. With fiber content, kale is very good to help digestion and smooth bowel movement. You should also note, that kale has a lot of iron. If calculated per calorie, kale has more iron than meat. Iron is very important for health, for example, for the formation of hemoglobin and enzymes, sends oxygen to the various parts of the body, regenerate cell-cell, helps liver function and much more. What is also very important to know is, Kale contains a lot of Vitamin K. Eating a diet that is high in Vitamin K can help fight cancer. Vitamin K is also necessary for many body functions including bone health and prevent blood clots. In addition, increased vitamin K can also help people who suffer from Alzheimer's disease. However excess doses of vitamin K can also have a negative impact on some people. Patients who are taking anticoagulant drugs (freezing) should avoid kale, due to its content of vitamin K can interfere with drug action. 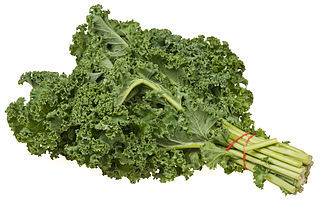 The other content of kale is lutein and zeaxanthin are very good that eye health is maintained. Along with antioxidants, as well as a fair amount of content in kale can lower cholesterol and reduce the risk of heart disease. Below you can read kale nutritional value based on USDA Nutrient database. Rich in calcium and iron, kale is needed by women during pregnancy to increase milk production and fetal development. Folic acid (vitamin B9) it also plays an important role for the nervous system of the baby. Kale has breast cancer ward properties by controlling estrogen in the body. Anti-oxidant and anti-inflammatory (inflammation) work together to get rid of various cancers. Not only cure for the disease, kale also has good properties keep skin beauty. Green leaves, antioxidants, iron, vitamin C, and E, which encourages the production of collagen preventing wrinkles. Chewing raw kaleleaves same as burn 34 calories. As much as 1.3 grams of fiber on a piece of kale able to meet the needs of fiber that keeps you full longer and expedite metabolism.